For those who have known nothing but despair for far too long, the idea of one's survival takes on an almost fervent urgency. 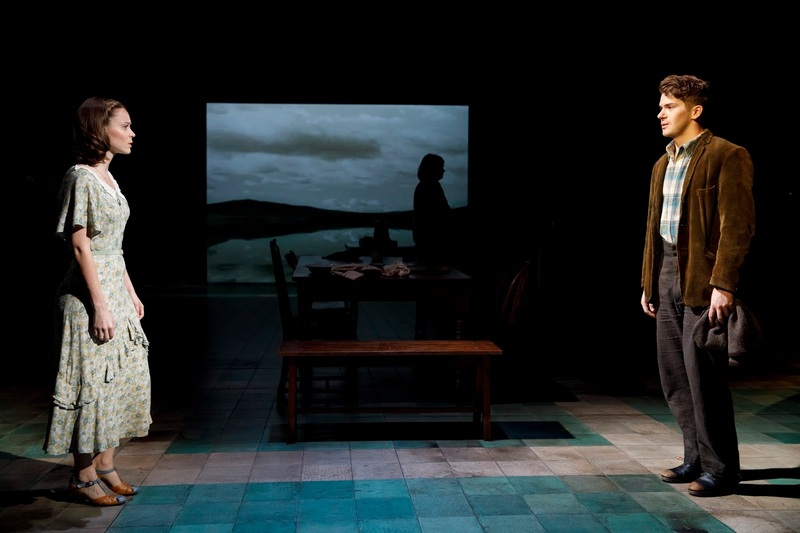 A reality brought devastatingly home in Girl From the North Country, now at The Public Theater. Writer Conor McPherson melding his text with the songs of Bob Dylan to examine the deeply buried or long-forgotten passions of the inhabitants of a Duluth, Minnesota boarding house during the Great Depression. It’s November of 1934 and the boarding house in question is run by Nick Laine (Stephen Bogardus), who lives there with his family. Nick, who has no head for business, is barely two months away from losing the building to a bank foreclosure. A fate to which Nick is now resigned. He doing his best in the meantime to care for his wife, Elizabeth (Marie Winningham), who has suffered what appears to be a mental breakdown. Nick is also continually urging his ne’er-do-well son Gene (Colton Ryan) to find a steady job; while trying to convince his daughter Marianne (Kimber Sprawl), pregnant by someone long since vanished, to wed a much older man. Someone she does not want or love. Said union however, would ensure a future for herself and her unborn child. Nick's actions toward his children taking on an increasing air of desperation as he tries to help them the only way he knows how. Also part of this ever-growing tableau are the various guests and long-term residents of the boarding house. Among them, Mrs. Neilsen (Jeannette Bayardelle), a woman in love with Nick and currently awaiting a long-expected cash windfall; Reverend Marlowe (David Pittu). a bible-selling preacher; Joe Scott (Sydney James Harcourt), a former prize fighter recently released from prison; and Mr. Burke (Marc Kudsich) a once-prosperous factory owner who lost everything in the stock market crash of 1929. Burke now trying to stay one step ahead of his creditors, with his long-suffering wife (Luba Mason) and somewhat slow-minded son (Todd Almond) in tow. Each of the characters are also carrying their own personal secrets, and will do almost anything to keep them hidden. Though when some are pushed to the breaking point, everyone around them becomes a potential sacrificial lamb in order to ensure their own survival. Despite their circumstances - or more accurately, because of them - many of the characters also have a need to leave behind some kind of mark to show they passed this way. Even if it’s only an attempt to bring truth to the lies they tell themselves. Burke’s actions and statements when he tries to convince Joe to let him become his manager being a perfect example of this. It’s the show's seamless blending of text and music which brilliantly brings the characters to life. Each of these fully-developed individuals quickly becoming far more than just an object of pity. The effect something akin to tapping directly into these people's psyches to reveal the torment within. Many longing most of all for a place and time that no longer exists. It may take a few minutes for the audience to become accustomed to this particular type of narrative structure, but by the time the third such song is introduced in this manner, one is able to easily move with the transition and perception of one scene to another. An excellent example of these conflicting emotions can be seen in the character of Nick. Nick believing, after all he's seen and experienced, that he's no longer capable of loving anyone. At one point he even questions if he still has a soul. Yet it eventually becomes obvious that Nick does care. As do they all. It's just that some of them have gone so far past the point of redemption, there's nothing left but despair. Kudos to Bogardus in making Nick come across as someone far more than just a simple loser. In a particularly nice touch, Tom Nelis does an excellent job as Mr. Perry, the owner of a shoe store, and Marianne’s would-be suitor. An old man, he's clearly making a fool of himself, and knows it. Yet he's quite willing to risk his pride and self-respect for the chance of a little happiness. Other standouts include Winningham, for whom fantasy seems to have become a refuge (her marriage to Nick having long since ended in all but name); Ryan, who must face losing the girl he loves (Caitlin Houlahan); and Pittu, who dreams of God and a perfect world, but who is forced to make his way amidst the gullibility and failings of man. The score is exquisite, with poetry of Dylan's lyrics never more evident. In many ways, it's as if one is hearing these songs for the first time. The scenarios and accompanying music such a perfect fit, it feels like they've always belonged together. McPherson shows the same sure-handedness with his direction that he does with his writing. The result being a smooth flowing presentation with not a single bit of business feeling out of place, extraneous or tacked on. Each character is also given their own chance to shine, so to speak, as the story spins toward its conclusion. Rae Smith’s set design is excellent. The pieces and backdrops calling to mind the time and era depicted. Also quite good is the on-stage orchestra. Several of the cast taking turns on one instrument or another during the performance. A process which, unlike other shows that have used this method, doesn't take a single thing away from the overall effect, but rather, helps add to it. Girl From the North Country (also the title of a Dylan song) offers a heartbreaking look at those who have lost what they care about the most, and who are desperately trying to begin again. If such a time is truly possible. It's an experience which stays with you long after you leave the theatre. 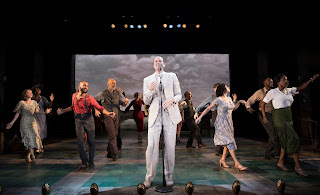 Featuring: Todd Almond (Elias Burke), Jeannette Bayardelle (Mrs. Neilsen), Stephen Bogardus (Nick Laine), Sydney James Harcourt (Joe Scott), Matthew Frederick Harris (Ensemble), Caitlin Houlahan (Kate Draper), Robert Joy (Dr. Walker), Marc Kudisch (Mr. Burke), Luba Mason (Mrs. Burke), Tom Nelis (Mr. Perry), David Pittu (Reverend Marlowe), Colton Ryan (Gene Laine), Kimber Sprawl (Marianne Laine), Rachel Stern (Ensemble). Chelsea Lee Williams (Ensemble), Mare Winningham (Elizabeth Laine).